The dog was never whelped that didn’t like liver. Tara and Princess think it’s pretty good too. Conventional pet treats are horridly expensive and have an ingredients list that only DuPont could love. Up here in crunchyland you can buy healthy pet treats, including dehydrated liver, for nosebleed prices. Or you can make your own for little money and less effort. 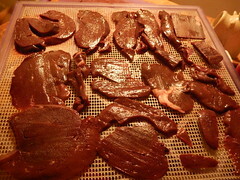 When you find a good deal on liver, whether a supermarket special or someone cleaning out a freezer, grab it. Freeze anything you won’t use immediately. Dice it and dehydrate it. If the pieces are a little too big, break them up. Put it in a freezer bag and store it with your pet stuff. Next time you want treats, there you are. 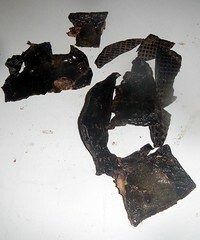 It takes about 48 hours in our dehydrator, about the same on a foil covered cookie sheet in your oven at 150F (60C). Just leave them till they’re crunchy. Store them in a freezer bag and you’re good to go (to the dog park, that is).